I got a call from Chris who was looking for a inshore fishing charter for tarpon fishing in Miami for him and his son. We decided that we could squeeze in some shark fishing also. He wanted to do some night fishing for the tarpon so we fished for sharks first thing. 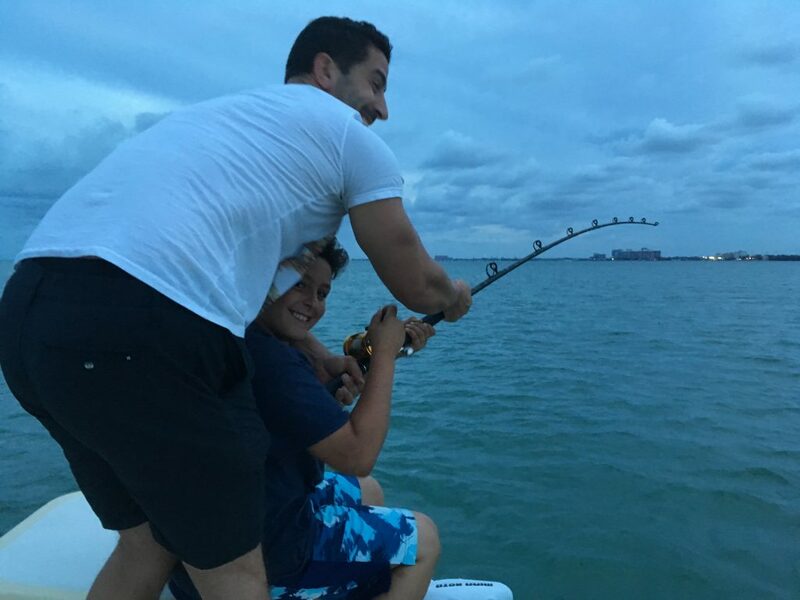 They caught shark bait with ease and got started shark fishing near Key Biscayne. The shark fishing was a little slow but we got hooked up to a good size black tip shark, but after the sharks second jump it pulled the hook out. After losing that shark we moved into the inshore waters of north Biscayne bay for the night tarpon fishing. We put some bait out for the tarpon and could see that we had tarpon in the area. It took a little while for us to get a bite but we did just as the sun was setting. We hooked into a very big tarpon that put on a great show. I counted it jumping nine times during what was about an one hour fight. We estimated this tarpon would weigh around one hundred and forty pounds. While I had the leader for the third time the hook pulled out.